SEOUL, South Korea -- The U.S. military said it moved 100 wooden coffins to the inter-Korean border on Saturday to prepare for North Korea's returning of the remains of American soldiers who have been missing since the 1950-53 Korean War. U.S. Forces Korea spokesman Col. Chad Carroll also said 158 metal transfer cases were sent to a U.S. air base near Seoul, South Korea's capital, and would be used to send the remains home. 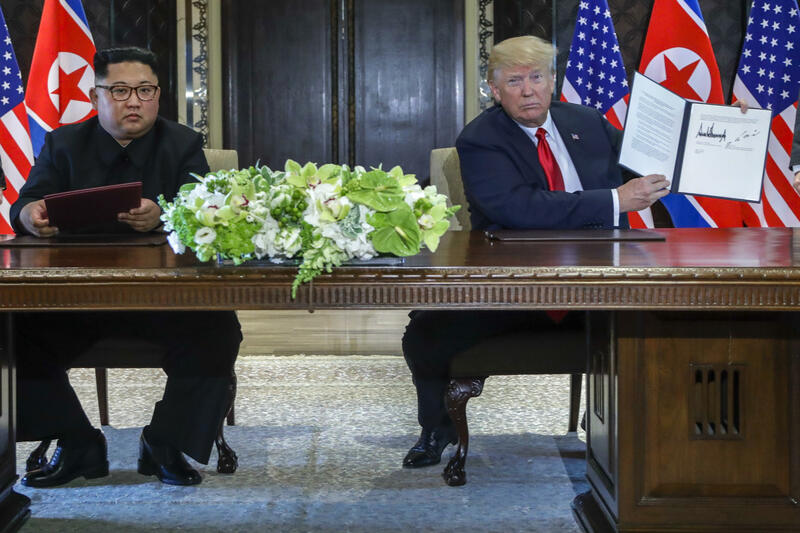 North Korea agreed to send home U.S. war remains during the June 12 summit between North Korean leader Kim Jong Un and President Donald Trump. While the U.S. military preparations suggest that the repatriation of U.S. war remains could be imminent, it remains unclear when and how it would occur. Earlier Saturday, Carroll denied a report by South Korea's Yonhap news agency that U.S. military vehicles carrying more than 200 caskets were planning to cross into North Korea on Saturday. He said plans for the repatriation were "still preliminary." U.S. Forces Korea said in a statement later in the day that 100 wooden "temporary transit cases" built in Seoul were sent to the Joint Security Area at the border as part of preparations to "receive and transport remains in a dignified manner when we get the call to do so." Between 1996 and 2005, joint U.S.-North Korea military search teams conducted 33 recovery operations that collected 229 sets of American remains. But efforts to recover and return other remains have stalled for more than a decade because of the North's nuclear weapons development and U.S. claims that the safety of recovery teams it sent during the administration of former President George W. Bush was not sufficiently guaranteed. Since his summit with Kim, Mr. Trump has hailed their meeting as a win for the U.S. In an excerpt of an interview with conservative pundit Mike Huckabee that was expected to air Saturday, Mr. Trump said the U.S. "got our hostages back, we get the remains back of our great heroes that have died. The big thing is the denuclearization." He also said the two leaders came to a "wonderful agreement" in Singapore, but that it's a "shame that the fake news covers it the way they do." "It's honestly, it's really almost treasonous, you want to know the truth," he said. "If you listen to the mainstream media, it's almost like I lost the negotiation." Mr. Trump and Kim left the summit signing a document that the president described as "important" and "comprehensive." The document said North Korea will commit to working towards denuclearization but offers few details about how that will be accomplished.